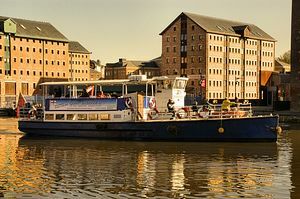 The Gloucester Waterways Museum is housed in an original Victorian warehouse in Gloucester's Historic docks. A hands-on learning experience that is full of fun for schools and families. Housed in a stunning Grade II listed warehouse on the side of the UK's most complete Victorian dock, we offer a time-travel opportunity to visit Victorian Gloucester. See how and why the canals were built and test your own skills with our indoor working lock system. Don't forget to explore our historic boats, or take a trip down the canal on one of our daily pleasure cruises. Follow brown signs for the "Historic docks" from M5 North/South, as well as within the city boundaries. Access to Docks from Southgate street.